What’s The Difference Between Translation Memory (TM) and A Glossary? Sometimes we get so close to translation and localization projects we forget that not everyone knows the tools and technology we use. 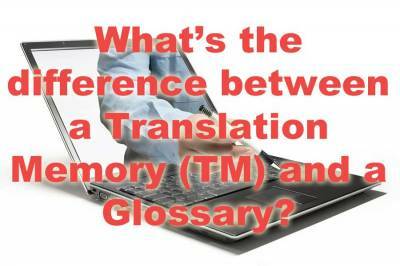 For example, we sometimes find ourselves explaining the difference between Translation Memory and a glossary or terminology database. This blog is dedicated to explaining that difference and the benefits of using both Translation Memory and glossaries for your translation and localization projects. We, like most professional translation companies, use Translation Memory and glossaries everyday to save our clients translation time and costs as well as to improve consistency and quality in the final project. Translation Memory (TM) is a translation tool used to monitor and assist with the translation process. Translation Memory is a software system or database that monitors the progress of translation in real time and memorizes each translated passage. When a paragraph or sentence is encountered that has been previously translated, the TM tool notifies the translator and allows him or her to insert or modify this previously translated text. How Is A Translation Memory Created? A Translation Memory is created at the beginning of a translation or localization project and grows throughout the course of the project as content is translated and stored. Translation Memory develops and expands with each translation. When each section or string of content is translated, it is saved and added to the Translation Memory. As it expands, the Translation Memory serves as a valuable tool for future translation and localization projects, both large and small. Translation Memory tools help achieve consistency and uniformity, because the same phrases are translated identically and the terminology is used consistently even if different translators work on different portions of a project. These tools provide greater uniformity of phrases and terminology throughout different documents on the same subject matter. This consistency is kept even if the documents are translated years apart, or if different translators work on separate portions of the same document. As a result, the translators’ productivity is increased, and the quality of their work is enhanced. TMs also help to control the costs and turnaround time throughout the translation and localization process. TM tools significantly decrease the time spent translating, thus lowering the cost to the client, resulting in quicker turnaround of the translated text. A glossary—sometimes called a terminology database, termbase or lexicon—is used for terminology management. A glossary is a centralized compilation of company, industry specific or technical terms. This collaborative tool combines pre-approved terms, images and reference materials for translators to share in real time, enhancing consistency and speeding the translation process. A good glossary will have source language key terms and approved target language translations, along with a clear definition and proper context for its usage. A glossary may also include specific terms or phrases that are not to be translated (NTBT), but are to be kept in the source language. Using a glossary is recommended when there is an abundance of specialized content. A glossary provides a unified approach to managing terminology for multiple projects across multiple languages. It is a valuable tool for effectively managing client specific terms in both source and target languages. In cases where there is a high volume of repetition it can save both time and money, while keeping consistency in the translation quality. A glossary is designed to be used by translation and localization translators in combination with their existing translation environment. A good terminology database eliminates ambiguity and serves as a guide to translation and localization experts in how to manage key terminology. While working on a project, key terms are automatically highlighted to notify the translator of the standardized approach for its translation. Beyond highlighting the key term, the terminology database also prompts the translator with the established, approved translation for that item. This guarantees consistency and accuracy each time a key term occurs. How is a Glossary created? To create a glossary, key terminology is identified that may not have a generally understood specific translation into another language and that should be consistent across all documents and languages. Often developing a glossary requires extra research to make sure key terms are properly identified. These key terms may include acronyms, names, titles or very subject specific terminology or information. Once the list of key terms is generated, corresponding translations for these terms are created. A review team manages the glossary, approving the translations. The client may also review, modify and approve terminology terms and images. A glossary is not static and should constantly be growing and changing as key terms are added and refined. When there is a lot of specialized content, a glossary eliminates ambiguity and serves as a guide on how to manage key terminology, which guarantees consistency and accuracy every time a key term occurs across all translation and localization projects. Having a glossary makes translations go smoothly by eliminating the need for translators to spend time researching terminology. Many glossaries are automated so that translators are able to quickly and efficiently find the correct translation of key terms, saving valuable time. It also reduces cost and turnaround time for all subsequent translations for which the glossary also applies. Translations are subjective due to the very nature of language. A glossary improves quality and guarantees consistency across all languages and iterations of a particular term by providing a standardized translation for key terms. This eliminates ambiguity and ensures that important terms are translated accurately and consistently every time they are used. A Translation Memory is a translation tool that is used to memorize and assist with consistently translating content, whereas a glossary is a guide for translators on how to translate specific terminology for a translation project. By providing clearly defined translations for key terminology, a glossary saves time, reduces costs, improves quality and maintains consistency across alltranslation and localization projects. Translation Memory maintains consistent terminology and automatically “translates” repetitive text, saving both time and money while improving overall quality. After the completion of each job for a client, the custom glossaries and the translation memory developed during the course of the project are updated and reconciled. This ensure that these tools are ready for use in subsequent projects, to maintain consistency across all translated documents, and to save costs by eliminating the need to re-translate previously translated passages. What experience have you have using Translation Memory and glossaries? What are the pros and cons of these translation tools? Please share your thoughts in our comments section below. As always, thank you for liking and sharing this blog socially using the buttons above.